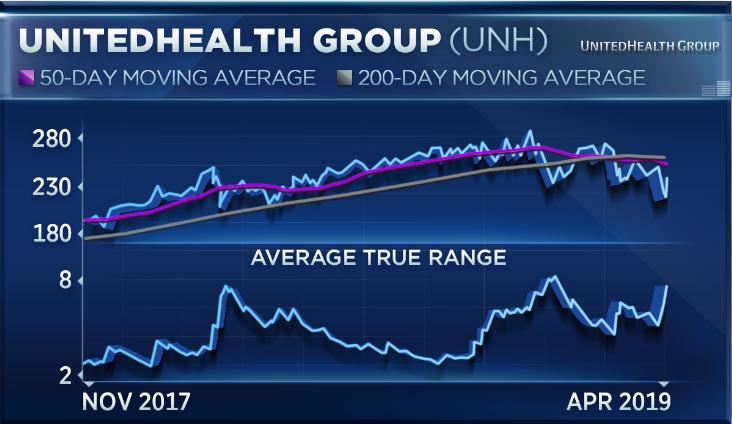 UnitedHealth Group's stock may not be as sickly as it seems, according to one investor. Shares of the health insurance provider have lost more than 12% in the last week, or roughly $35 billion in market cap. The weakness continued Wednesday after UnitedHealth reported earnings, with the stock hitting a new 52-week low. Its action was markedly different from that of fellow health-care giant Johnson & Johnson, shares of which surged about 2% after the pharmaceutical company's own earnings report. Between the two, Gradient Investments President Michael Binger sees UnitedHealth as the better pick. "We own both stocks and I think they both had excellent quarters," Binger said Tuesday on CNBC's "Trading Nation," calling Johnson & Johnson a "high-quality company" with consistent performance and a good yield. But "the stock I think we should be focusing on today is UnitedHealth," he said. "They beat earnings, they raised 2019 earnings, they had excellent cost management of their medical losses, but the stock is selling off big-time due to political noise." Binger may have been referring to what some — including UnitedHealth's CEO — see as a looming threat to the nation's health-care system: a series of "Medicare for All" proposals being promoted by some Democrats. "Now, one thing I know is that politicians … have consistently for years attacked health-care costs and the health-care system," Binger said. "And I also know that nothing gets done and it keeps going. So, today, I would take advantage of this. I would buy UnitedHealthcare. You've got a very cheap company that's growing revenue [by] high-single digits and earnings that are growing [in the] mid-teens. So I would own it today." Blue Line Futures President Bill Baruch wasn't so convinced. "I cannot be a buyer of UNH after this bad day and even worse week, and here's why. The average true range, which is a measurement of volatility, is broadening as we're seeing new lows and lower lows," he said in the same "Trading Nation" interview. "Ultimately, the 50-day moving average crossed below the 200-day moving average in February. This is the death cross," Baruch continued. "I'm going to get out of the way of this for now." He does like the stock of Johnson & Johnson, however, noting that it's managed to hold above its trend line from 2016. "There is solid momentum, with the 50-day moving average crossing out above the 200 in February," he said. "So, ultimately, ... if we close stronger here and make new highs, I think that this is going to bring a tailwind, and you're going to see some momentum higher." Shares of UnitedHealth made a new 52-week low on Tuesday and again on Wednesday. Johnson & Johnson's stock opened higher on Wednesday before flattening later in the morning. Disclosure: Gradient Investments owns shares of UnitedHealth and Johnson & Johnson in its portfolios.